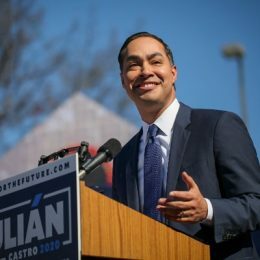 On December 12, 2018, Julian Castro (44), announced the formation of a committee to investigate a presidential campaign. Castro graduated from Stanford in 1996 with a bachelor’s degree in political science and communications. He served as the mayor of San Antonio from 2009 until 2014 when he joined Obama’s cabinet in 2014 as the 16th United States Secretary of Housing and Urban Development which he held until 2017. As of 4/13/19 He has not released fundraising totals. Others included Elizabeth Warren (7 percent), Kamala Harris (7), Beto O'Rourke (6), Amy Klobuchar (4), Cory Booker (3) and Julian Castro (2). Cory Booker, Julian Castro, Rep. Tulsi Gabbard, Sen. Amy Klobuchar, and Sen. Elizabeth Warren for a presidential forum in Houston next week.